Whether you eat a whole box of chocolates or fast for the day, the pancreatic beta-cells ensure that your blood glucose level remains relatively constant by regulating the release of insulin from the pancreatic beta-cells. Diabetes results when insulin release is inadequate and blood glucose levels chronically rise. This lecture will describe how a membrane protein pore known as the ATP-sensitive potassium (KATP) channel plays a vitally important role in regulating insulin secretion and show how mutations in KATP channel genes can cause neonatal diabetes, a rare genetic form of diabetes that develops soon after birth, and occasionally also developmental problems. It will also reveal how an understanding of KATP channel function has led to a new therapy for patients with neonatal diabetes. Professor Ashcroft’s research focuses on ion channels and their role in insulin secretion. 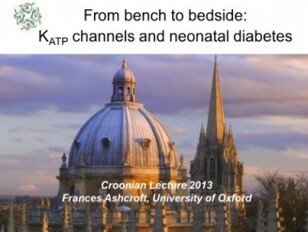 She was awarded the Croonian Lecture for outstanding work on the link between glucose metabolism and insulin secretion, and the key role and mechanism of action of the ATP-sensitive potassium channel, and its role in neonatal diabetes.